The BAC is pleased to announce Kim McCarthy, MDS '14, has been awarded second place in the Temporary Structures Concept Design Category in Architecture Podium's International Architecture Awards 2015. She earned the award in recognition of her Master of Design Studies capstone project, Resilient Crisis Cube. 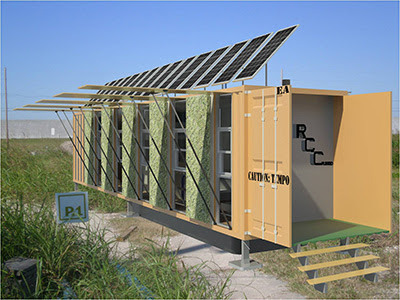 The Resilient Crisis Cube is an off-grid emergency shelter, which incorporates resilient concepts into the design. It is intended to provide shelter, energy, water collection, and food production to its occupants, who would receive it following damage or complete loss of property following a disaster. The project ties into a larger disaster strategy that focuses on developing community resilience prior to, during, and following a disaster. Architecture Podium's International Architecture Awards 2015 received over 500 entries. The awards consisted of 36 categories with over 25 esteemed judges from around the globe. The Temporary Structures Category recognized the best architectural temporary structure or pop-ups. Kim's main goals for the project were to create a disaster preparation, response, and recovery strategy based on resilient concepts that could be applied on regional, local, and individual levels. The design creates a simple solution that addresses a wide variety of needs following a disaster and provides a healthy adaptable shelter with a small ecological footprint. Lastly, the project strives to make a statement on the importance of disaster preparedness. "To me, this acknowledges that the goals I wanted to achieve are a part of a larger global conversation on disaster preparation and how that relates to community resiliency," said Kim. "We need to start developing adaptable strategies and re-evaluating how we build and prepare for an unknown environmental future." Kim graduated from the BAC in 2014 with a Master of Design Studies in Sustainable Design and is currently employed by Lavallee Brensinger Architects. She plans to continue to develop these ideas into a publication to support the original goals of the project.